Dial Indicator / Displacement Transducer Brackets - Gilson Co. Dial Indicator/Displacement Transducer Brackets position Transducers and Digital or Mechanical Dial Indicators on Pro-Loader Load Frames used in a range of soil and asphalt testing applications. Brackets are secured between Load Cell or Ring and load frame crossmember. 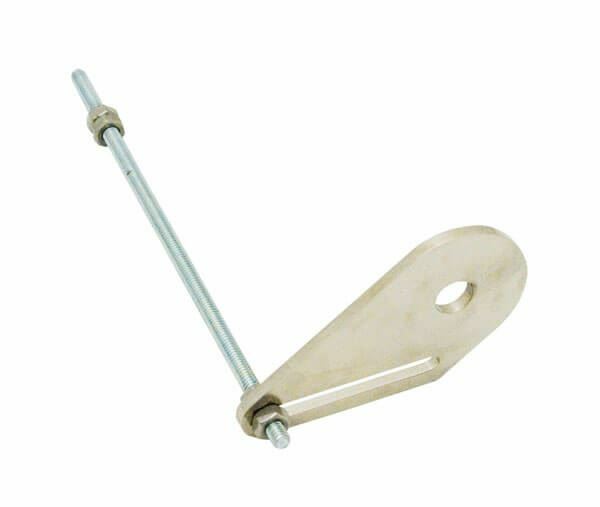 Slot for threaded rod allows adjustable positioning of instruments. HMA-339 Bracket mounts to Load Rings and Load Cells with 1/2in (12.7mm) diameter load buttons or studs, and supports Linear Variable Displacement Transducers (LVDT’s) and Dial Indicators. This bracket works with HM-421D 500lbf, HM-422D 1,000lbf, HM-424D 1,500lbf and HM-425D 2,000lbf Load Cells, and Gilson Load Rings up to 10,000lbf. HMA-401 Bracket mounts on Load Frames to Load Cells with 3/4in (19.mm) diameter load buttons or studs and supports Linear Variable Displacement Transducers (LVDT’s) and Dial Indicators used on HM-428D 5,000lbf and HM-430D 10,000lbf Load Cells.